← First, a misspent youth……now this. I wonder how many of you reading this know of the existence of a very unusual artistic medium. 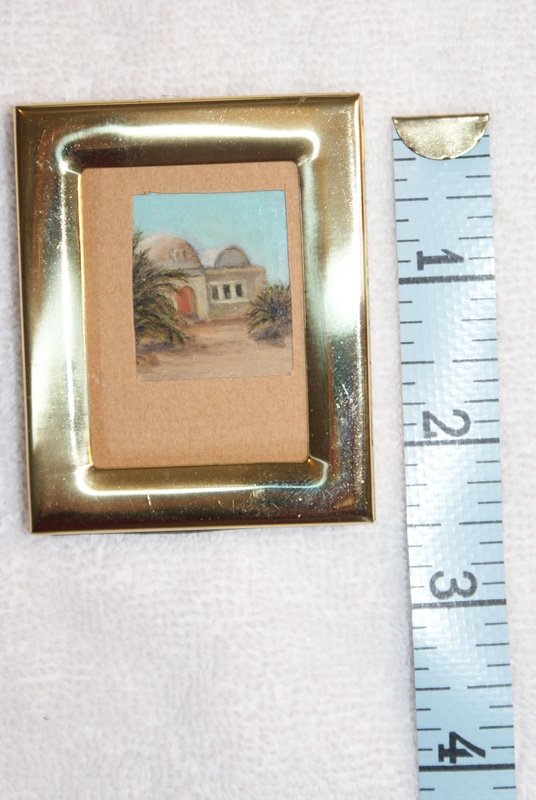 It’s officially called miniature art but is affectionately known as postage stamp art because it is painted on such a small-scale. It’s a unique approach to painting. 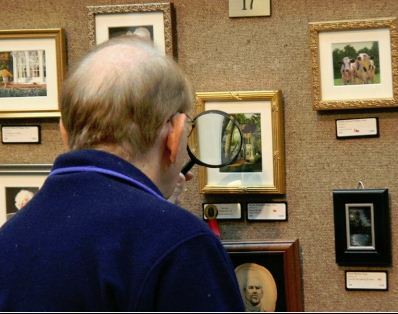 There are miniature art shows all around the country. Normally, this art is viewed best with a magnifying glass (see picture below) so you might want to use that feature on your computer if you want to see some more detail. 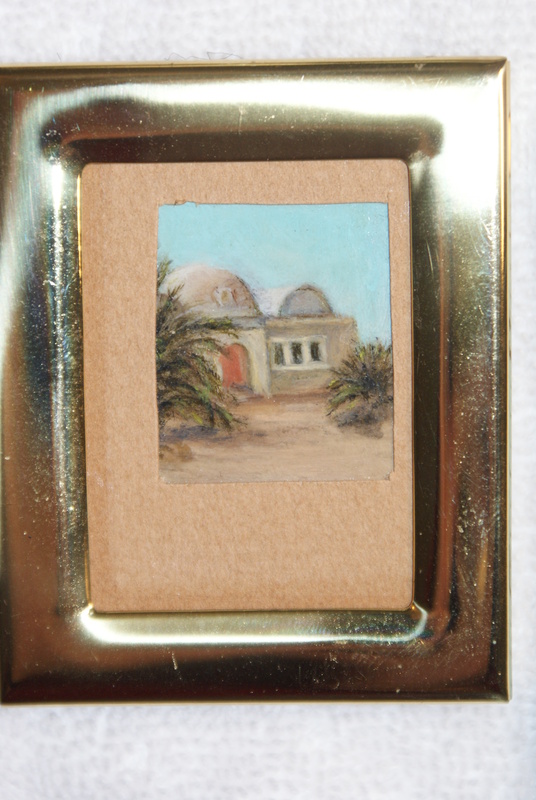 Photo courtesy of Florida Miniature Art Assoc. 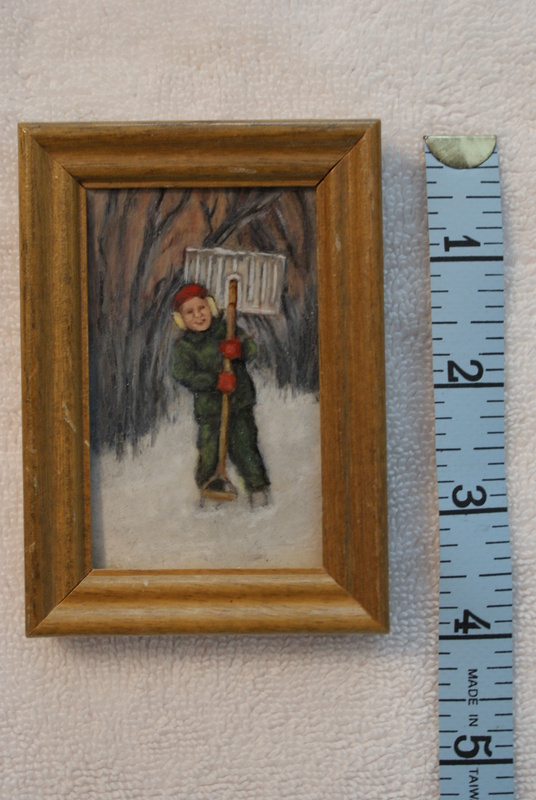 My mother, who was very accomplished artist in many fields, took up this medium later in her life. Her work was displayed at several of the art shows mentioned above. 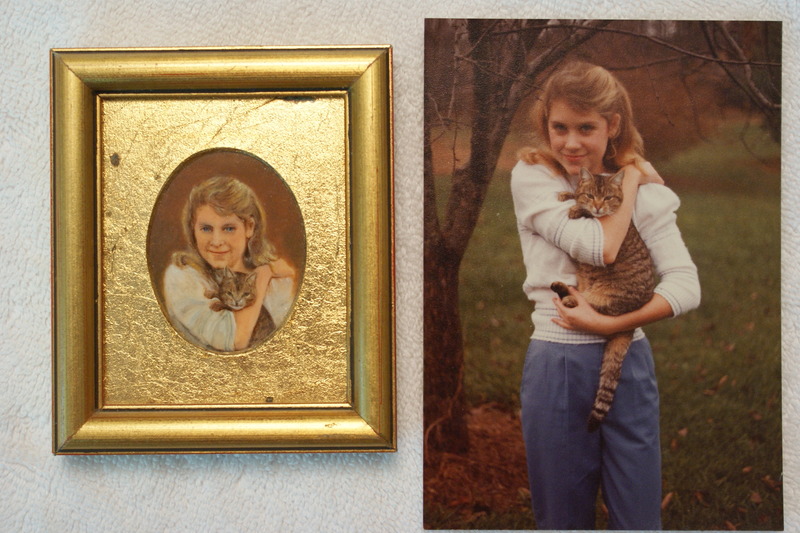 She passed away about 3 years ago but left her family a gift that will be passed down for generations. I am dedicating this blog to her and her wonderful talent. I marvel at these each time I view them. In order for you to appreciate the small size of these paintings, I have placed a measuring tape or coin next to them for the effect. 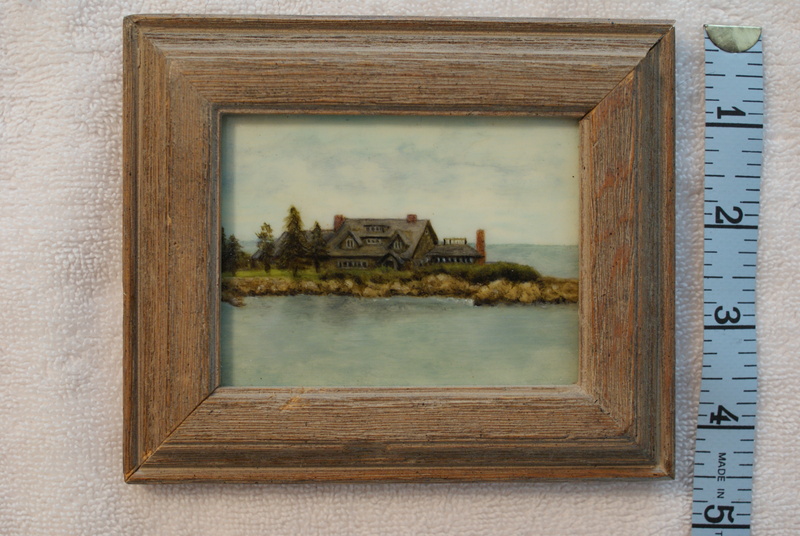 I still remember her sitting at her easel with her paint brush with just one bristle and the large magnifying glass extended from a mechanical arm that was fastened to the easel. These were oil on canvas paintings so it was painstaking work. I hope you enjoy them. Click on them to see a larger version. Above is the smallest one she ever did. Just over 1 inch painting surface. 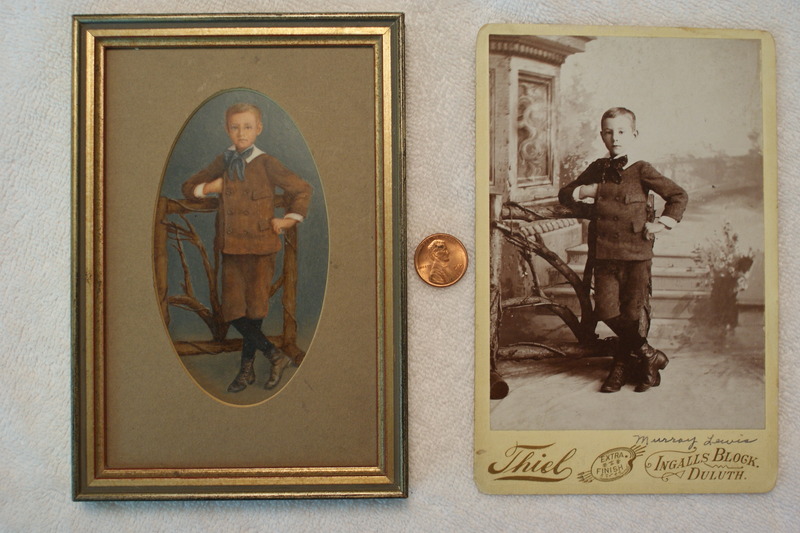 The one on the left is me at 5 years old. On the right is my son at 1 1/2 years old. Upper left, a Florida horse farm.Below it, the childhood home of Jacqueline Kennedy. 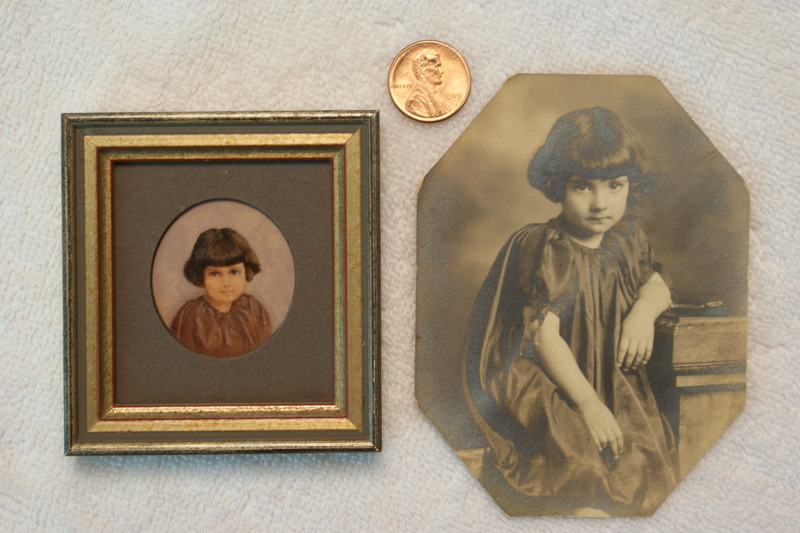 On the right is her mother (my grandmother) at age 11. On the left she is 81 years old. The picture on the right won 1st place at one of the shows. As you might have guessed, all of these paintings were done from photographs. 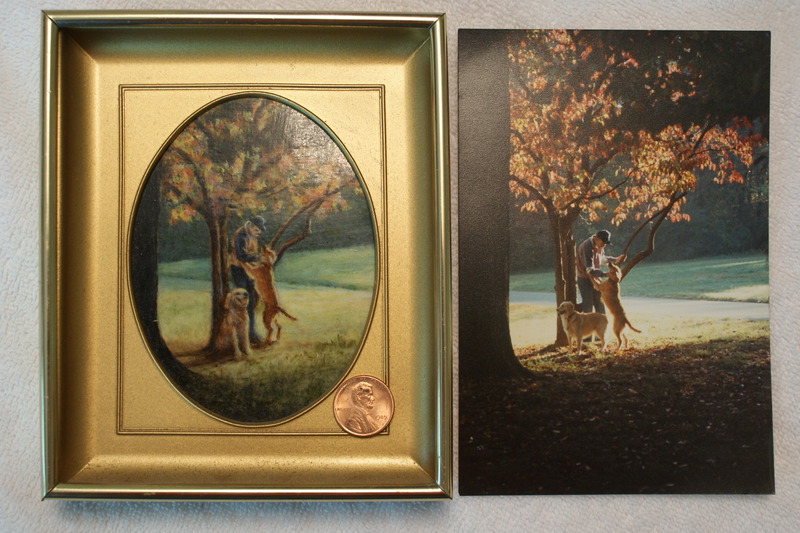 By way of comparison, I have displayed a few with the actual photograph on the right. 1. Me on a walk with the dogs. Notice anything unusual about this? 2. My step-father’s father taken as a boy. 4. 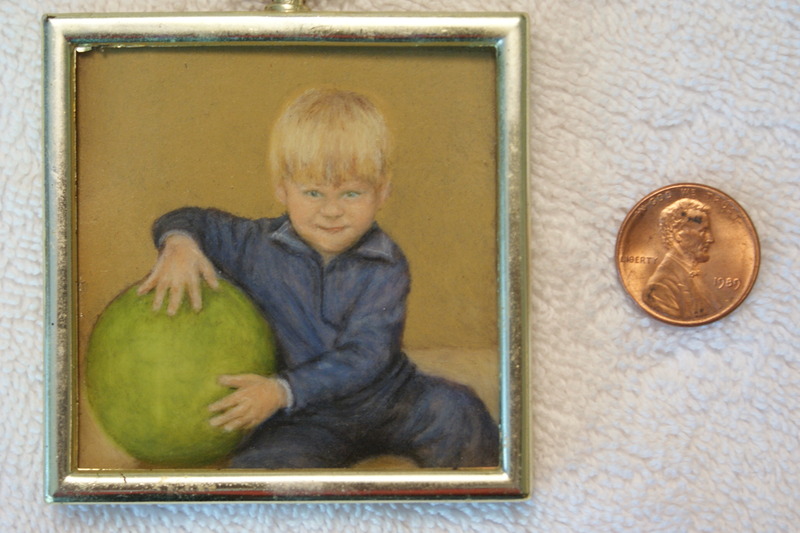 My mother’s self-portrait from a picture of her at 4 years old. 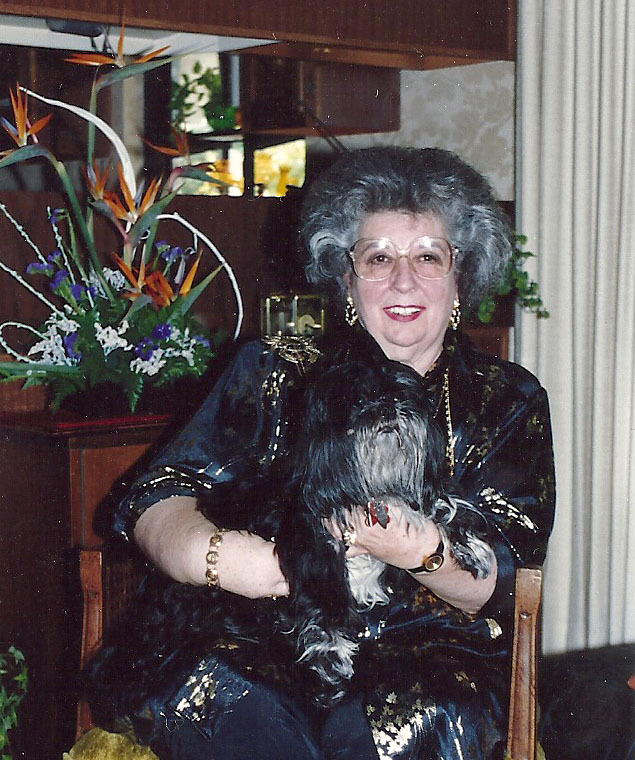 Below is a picture of the artist herself, Elizabeth F. Lewis, during her “postage stamp art” heyday. She also did portraits of each of us including our granddaughters that will be family heirlooms for future generations. Unfortunately, her talent skipped over me but it may yet emerge again with an unsuspecting offspring. 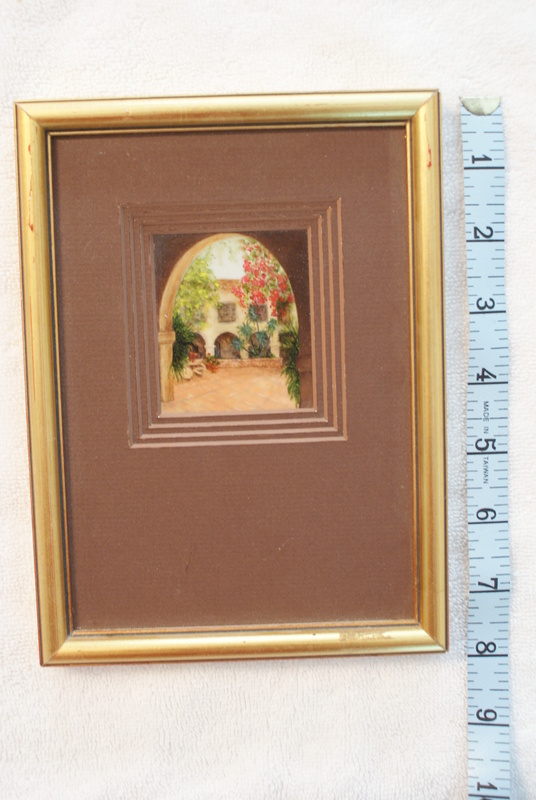 This entry was posted in Family and tagged Art, Miniature art, Oil painting, Postage Stamp Art. Bookmark the permalink. you’re no longer really much more neatly-preferred than you may be now. They are a treasure for us for sure!! I have been to a few of those shows myself. There are some exquisite things on display for sure. When I go the National Gallery in Wash, DC (which I do as often as possible) and see paintings that take up nearly a whole wall, I marvel at how it is just the same medium on a different scale. Big Al, your up for Versatile Blogger award, check out this post. Thanks, Jodi. I’m not sure if I’m versatile or just scatterbrained but I love awards! What a talented woman, and great legacy for your family. When I was a kid, I loved going to Chicago to the Museum of Science & Industry, especially for Colleen Moore’s doll house. I was fascinated by the fact that all the artwork was real, as were the tiny books. Fascinating. She also had a miniature doll house phase which was quite something. Also did some gorgeous needlework pieces. She was quite an artistic talent. I, meanwhile, am totally devoid of any artistic merit. I do however, draw a mean stick figure. There’s quite a few good websites if you want to Google them. Featured artists who do some amazing stuff. Thanks for the comment. Like like triple-like! These are incredible. What an amazing talent. Heirlooms indeed. Thanks, thanks, triple-thanks, Tilly Bud. You have a treasure there. Thanks for sharing it with us. 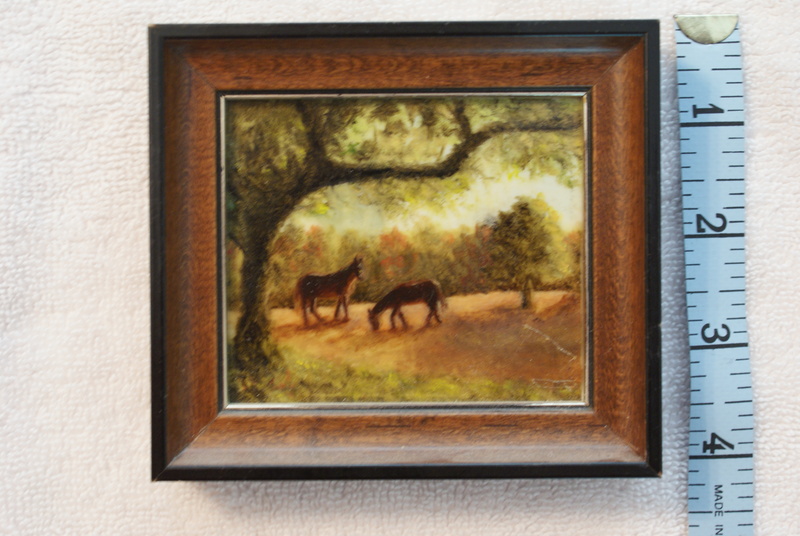 Such an incredible talent Al, why do you thing she would choose to paint in minature? I recognized Michael immediately. And I did notice that the dog to the left is in a different position. What a treasure for you! That’s an excellent question Jeri. She had breast cancer and as a result suffered from lymphodema or swelling of the arms. 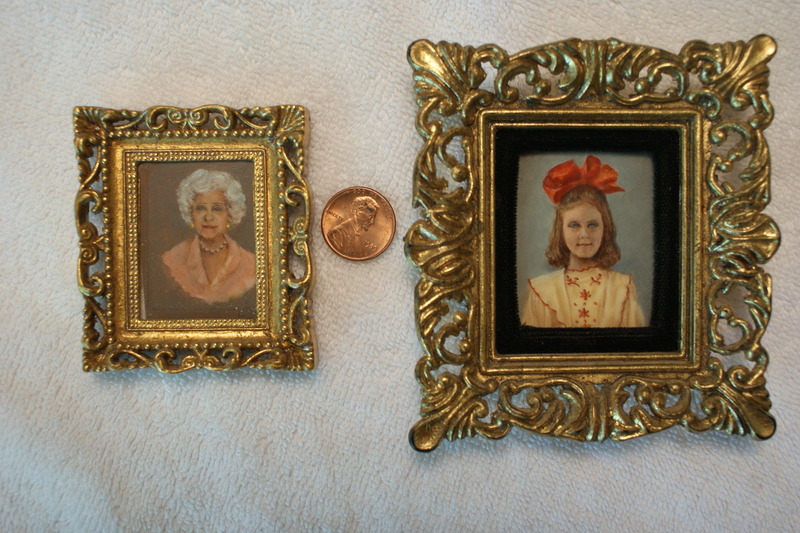 It was hard for her to paint holding up her arms so she went to miniatures where she could rest them while painting. She had done beautiful portrait painting up until then. Congratulations on the dog mystery. I have no idea why she did that and didn’t realize it myself until I did this blog. I noticed the dog too, how strange, all the other pictures are excellent copies! Maybe your dog was modelling for her as she painted, or he merged two photos? 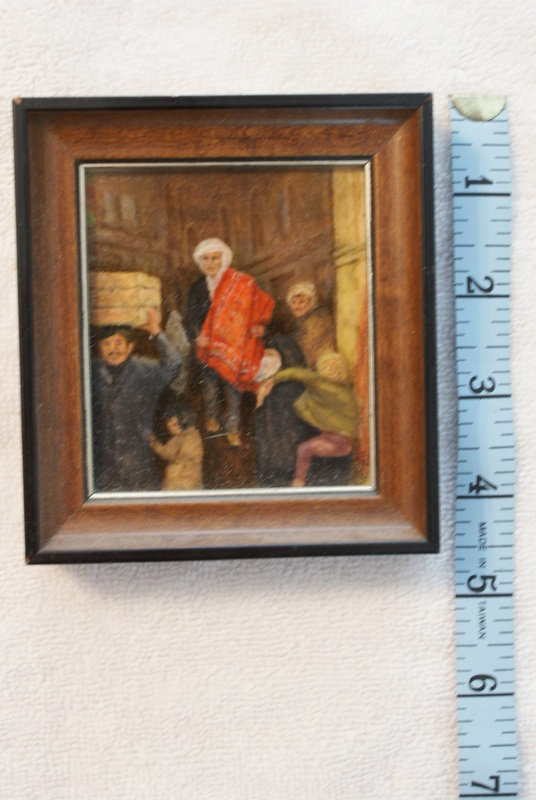 Amazing paintings, and so tiny!! I’ll have the last laugh some day when that likeness is hung in effigy in the Louvre. Very well done. Must have been difficult to include all the photos as well. Wouldn’t your mom be happy to read this blog. Thanks Bernice. I did spent a good amount of time on this, but probably not as much as her on just one painting. She did about 50 miniatures overall. Those are beautiful and probably priceless. Antiques Road Show would love to see them! That was a beautiful tribute to your mom. Nicely said. Thanks Jodi. Quite a nice gift from her to the family.